RedHub has a clever tender module that is linked to your RedHub project. Find out how you can tap into the vast subcontractor database when tendering. Companies can also use the Tendering Module for stand-alone lump sum tenders. Stay abreast of project communications with your architect, consultants, subcontractors and suppliers throughout the project life. Fully customise your mail types, templates, forms and explore many more mail features. RedHub is a complete management system used by developers, builders and construction companies. RedHub excels at being intuitive, easy to use and very cost effective. All the features you need to run your projects quickly and efficiently. Access your projects from anywhere at anytime. Learn more about the RedHub approach in keeping information secure. We provide fast friendly local support, and encourage feedback. 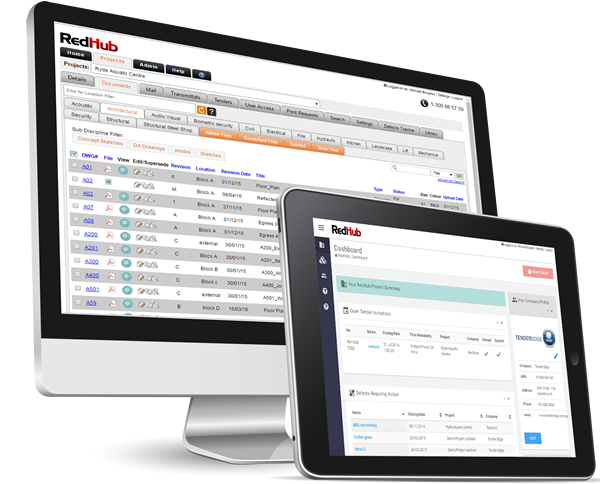 RedHub is one of the best value for money systems on the market. Create projects in minutes, and discover how intuitive RedHub is to manage your project. RedHub will help build productivity by reducing paper and improving communications. RedHub has a clever archiving system where your projects can easily be saved and stored online. Archives remain easily accessible for instant reactivation. You will be saving money whilst your projects are in archive and you will also have the peace of mind knowing that your projects are stored securely.